This guide provides an overview for the use and configuration of WebFrame Kiosk and WebFrame Pro Kiosk. It also provides guidance for content-specific use cases (websites, web apps, video, etc.). This guide provides step-by-step instructions on pairing WebFrame with either Guided Access Mode or Single App Mode. Finally, it serves as a running list of FAQs from WebFrame users. WebFrame is a full-screen kiosk browser for iOS. It is specifically designed to keep users in the experience intended by an administrator. As such, it does not include a navigation bar or in-app settings. All configuration of WebFrame is done either locally through the iOS Settings.app or remotely through an MDM/EMM product like JAMF, VMWare Workspace One, MobileIron, Microsoft Intune, etc. The starting point for WebFrame is the Homepage URL. The Homepage URL must be properly formatted according to W3C standards and can include query string parameters and/or file extensions for document and multimedia files. WebFrame supports insecure HTTP websites; however, we recommend using HTTPS whenever possible. To preserve user privacy and provide a pristine environment for each user, you can configure WebFrame to clear any cookies, session state, back/forward lists, or other cached data when the homepage is reloaded. The information will be cleared when the homepage is reloaded through the pull to reload gesture, inactivity timeout, or setting configuration changes. WebFrame has been intentionally created to provide a managed and curated kiosk experience rather than a general purpose browser. However, depending on the website or app configured as the WebFrame homepage, users may still be able to access more of the internet than intended. A common issue is links to Google or other external websites when using an existing website/app as the WebFrame homepage. Domain limiting is a great way to use an existing website, while ensuring users cannot browse the entire internet from your kiosk. The Domain Limiting Options section configures the list of allowed domains that can be browsed in WebFrame. The feature is enabled by default but can be turned on or off with the Limit Browsing to Specific Domains toggle. The Inactivity Timer ensures that users are greeted with a fresh environment rather than where the previous user left off. If a user simply walks away from the kiosk, WebFrame will wait the specified amount of time, then reload the configured Homepage URL. When combined with Clear Browser Cache on Reload, the previous session state, cookies, back/forward history, etc. will also be cleared upon timeout. The Inactivity Timer begins counting down the moment a user interacts with the screen (tap, swipe, or other gesture). The timer resets with each additional touch. If a user does not interact with the screen for a specified amount of time, the Homepage URL will be reloaded and the process will repeat. Please note that because the timer starts on the first interaction (rather than page load), an unattended kiosk will not endlessly reload the Homepage URL. The Inactivity Timer can be enabled or disabled with the toggle in the Inactivity Timeout Options section. The timeout value can be selected from the Reload Homepage After list with available options of 1 minute, 2 minutes, 3 minutes, 5 minutes, 10 minutes, or 15 minutes. WebFrame supports interactive kiosks as well as non-interactive information displays. By default, WebFrame is configured for user interaction. However, if you would like a non-interactive kiosk (information display, looping video, etc. ), then simply toggle the Enable User Interaction setting. Some user interfaces are better suited for taps only. If this is the case, vertical scrolling and horizontal panning can be disabled with this setting. Use this setting to disable pinch and double tap zoom gestures. Note: There is a known issue that if this setting is toggle off to on, and “Clear Browser Cache on Reload” is disabled, the double tap zoom gesture won’t work until the app is restarted. With the introduction of iPhone X, Apple introduced the concept of “Safe Area”, an area of the screen that will not be obscured in any way by the camera sensor array or the rounded edges of the screen. For iPhone X, Xs, Xs Max, and Xr, WebFrame supports multiple screen options. The Full Screen Option in WebFrame will allow a user to select Safe Area, Full Screen, and Full Screen (Modify Page Viewport). Beginning in version 1.4.0, WebFrame supports the HTML window.print() function to allow printing from web pages. To prevent printing, toggle this setting off. Safe Area is selected by default, forcing WebFrame to comply with the Apple-defined Safe Area with a black border (more on that next) for the areas of the screen outside of the safe area. The black border blends nicely with the physical screen for a seamless edge. See the first image below for an example. The Full Screen option is great for photographic cover pages or other visually-intensive pages or documents that are better suited for a full screen experience. The final option, Full Screen (Modify Page Viewport), is an advanced option that should only be used in very controlled environments. Modern web technology can detect and enforce its own safe areas, regardless of what has been configured in the browser. For an example, see the third image below. WebFrame has been configured in “Full Screen”. However, the page detects and enforces its own safe area to ensure the navigation items are not obscured by the camera sensor array. If you would like to override that behavior without changing the website, you can choose the “Modify Page Viewport” option in WebFrame to override the settings on the underlying webpage. As mentioned above, iPhone X, Xs, Xs Max, and Xr include a “Safe Area” of the screen to ensure controls, branding, or other elements are not obscured by the camera sensor array or the rounded corners of the screen. By default, WebFrame will use a black frame around the edges of the screen. However, the Safe Area Color setting allows an administrator to configure a different color (specified as a six digit RGB hex value) that matches company branding, dominant page colors, etc. For example, see the images with the default frame color (000000) and Starbucks green (0d6343) to match the page branding. There are several options to customize kiosk navigation including gestures and navigation buttons. When enabled, this setting will allow a user to swipe right on the screen to go back or swipe left on the screen to go forward. Note that this is only applicable when back or forward navigation is possible and when Enable User Interaction has been enabled in User Interface Options. Users that aren’t familiar with iOS devices may not be aware of back/forward swipe gestures. To make navigation more visible and accessible to these users, WebFrame supports Smart Navigation Buttons that will allow for intuitive back/forward navigation. The Smart Navigation Button can be prepositioned around the screen by users. They can also be configured to minimize on scrolling and to only appear when navigation is possible. To move the Smart Navigation Buttons, a user can tap and hold, then drag the buttons upward or downward on the screen to reposition. There are times when navigation is not possible. In such cases, WebFrame Smart Navigation Buttons can be configured to only appear when navigation back or forward is possible. This prevents the interface from being cluttered with unnecessary buttons. WebFrame will minimize Smart Navigation Buttons to a partially visible state as the user scrolls in order to provide a full screen experience. This behavior can be turned off to force the navigation buttons to remain fully visible. WebFrame and WebFrame Pro can be completely configured in iOS Settings. See the WebFrame or WebFrame Pro sections. WebFrame Pro Kiosk is compatible with the AppConfig standard. Any modern MDM/EMM product that supports AppConfig (JAMF, VMWare Workspace One, MobileIron, Microsoft Intune, etc.) can deploy and manage WebFrame Pro. Clears browser cache when the idle timer reloads the homepage URL. Limit navigation to a predefined list of allowed domains. Enable/disable the idle device timeout. Number of seconds before an idle device reloads the homepage URL. Enable/disable vertical scroll and horizontal pan gestures. Enable/disable pinch and double-tap zoom gestures. Enable/disable printing from HTML window.print(). Configures the full screen option of the view. 0 for Safe Area constraints, 1 for full screen, 2 for full screen with page viewport overrides. Six-digit hex code specifying the color for the screen above the Safe Area constraints. Must begin with ‘#’ (for example: #C19304). Configures the “pull-to-refresh” action. 0 for off, 1 to refresh the current page, 2 to reload homepage. Enable/disable swipe gestures for browser back/forward. When enabled, Smart Navigation Buttons will be hidden when inactive. When disabled, buttons will always be visible. When enabled, Smart Navigation Buttons will minimize on scroll. When disabled, buttons will not minimize. For general websites, simply configure the Homepage URL to the full address of the site. This can include the full address path as well as any query string parameters. If the site has its own navigation and it is preferable to back/forward navigation, disable swipe gestures and Smart Navigation Buttons. Web apps and Progressive Web Apps are generally handled the same way as websites. Configure the homepage URL to the address of the web app (for example, “https://app.starbucks.com”) and configure user interface and navigation options accordingly. There are two options when configuring WebFrame to play video: A URL to a page containing a player (e.g. YouTube), or a direct URL to a video file and extension. In general, we recommend using a webpage such as YouTube, Vimeo or a page you build yourself. This will provide the most flexibility around things like autostart, loop, etc. For a full list of YouTube player parameters, please see YouTube Embedded Players and Player Parameters in the YouTube IFrame Player API documentation. Please note that some YouTube parameters (such as “autoplay”), do not work on iOS. This is a limitation of iOS (including WebKit and Safari) as a platform and is not specific to WebFrame. Because autoplay does not work on iOS, “Enable User Interaction” should be set to Enabled so that you can start the video initially. Generally, to use documents as a kiosk, simply host the document at a publicly accessible URL and set that URL as the Homepage in WebFrame. There are many tools for creating interactive user experiences without writing code. One such solution is InVision. With InVision, it is possible to create a fully interactive experience then share that experience, or “prototype” with a URL. To learn more about InVision, see https://www.invisionapp.com. For this guide, we will use an existing sample prototype created by InVision. Once, a prototype has been create, it can be shared through a link. Simply click the “Share” button at the top of the screen. Finally, copy the Private URL and use it as the Homepage URL for WebFrame. Load WebFrame and the InVision prototype will load as an interactive kiosk. 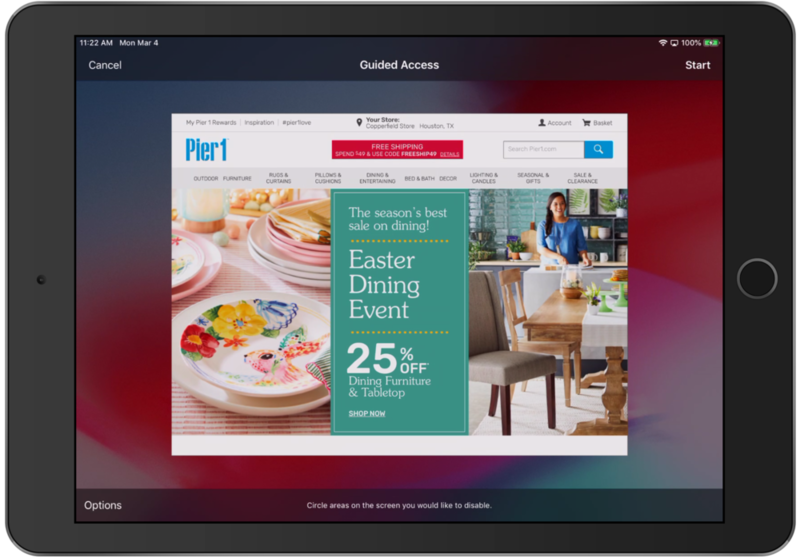 Guided Access Mode provides an easy and convenient way to lock an iOS device down to a single app without the need for a manageability solution. To setup Guided Access Mode, please refer to this guide from Apple. Open WebFrame or WebFrame Pro, then triple-click the Home button. For newer devices without a home button, triple-click the lock button. Device “Supervision” provides a added layer of manageability and security to iOS devices. There are two ways to make an iOS device Supervised: Apple’s Device Enrollment Program (DEP), or the Apple Configurator app. For information on Supervising an iOS device, please refer to the Apple DEP documentation or the Apple Configurator help documentation. Once a device is Supervised, it can be put into “Single App Mode” using either Apple Configurator or an MDM solution. 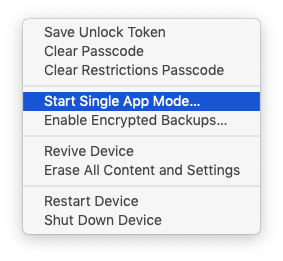 Using MDM, Single App Mode is typically enabled through a Configuration Profile. See the documentation for the specific MDM/EMM solution in use. For this guide, we will provide high-level guidance. Purchase WebFrame Pro Kiosk for the organization. WebFrame Pro Kiosk is recommended over WebFrame Kiosk because it can be remotely managed. So it’s just a webpage? No, WebFrame is not just a webpage. It is a browser specifically designed to be configured as a kiosk for iOS devices, with features target to ensure the best possible experience, usability, manageability, and security for a kiosk implementaiton. WebFrame is built on WebKit, the same engine that powers Safari. In general, if Safari can display something without the need for a plug-in, then WebFrame can display the same content. In general, we recommend websites, web apps, documents, and multimedia (in iOS natively supported formats). WebFrame Kiosk and WebFrame Pro Kiosk can both be managed locally in the iOS Settings app. WebFrame Kiosk Pro can be managed remotely through EMM/MDM solutions that support the AppConfig standard. Why doesn’t it have a navigation bar? The intent for WebFrame is to provide a full-screen experience so that users are immersed the experience you define. It is also important to keep users in the experience you curate. A navigation bar would detract from both of those goals. However, in the future we are looking at options to allow a configurable navigation bar for customers that want to provide a more open experience. How do I deploy in an enterprise? WebFrame can be deployed through Apple’s Volume Purchase Program for enterprise or education. We recommend deploying WebFrame Kiosk Pro, since it can also be remotely configured at enterprise scale, whereas WebFrame Kiosk can only be managed locally through the iOS Settings app. Can I change the app icon? Currently, no, but this is something we’re investigating. If you are interested in a custom version of WebFrame that includes custom icons, hard-coded URLs, etc., please contact us.